An exhibition whose main focus is on the re-creation of Sandford’s once famous woven serge cloth called Perpetuana. 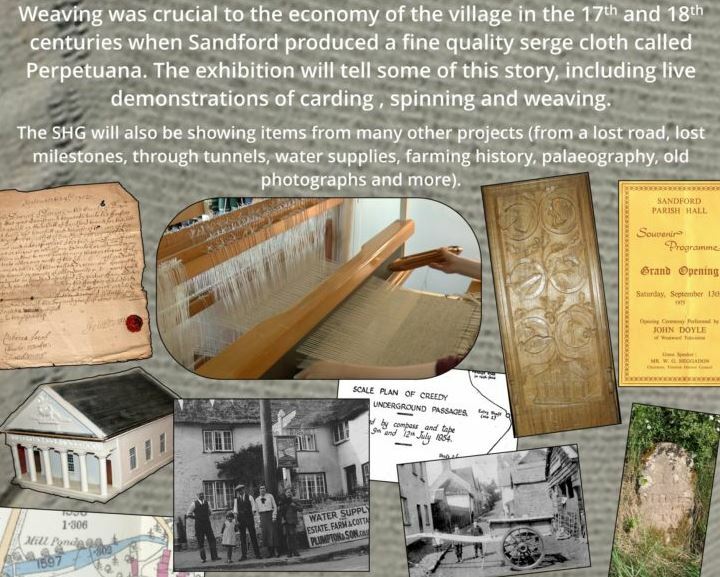 Demonstrations of wool carding, spinning and weaving will be given. Proudly present their 6th annual Art and Craft Fair in Whitestone Parish Hall on Sunday 13 May, 2012. Famous local artists will be showing their work and may even be painting during the Fair – and there’ll be some fine art photography. Crafts include woodturning, glass engraving, exotic garden sculptures, fine wood fretwork, pottery, silk necklaces, scarves and cardigans, silver and semi-precious stone jewellery, stained glass, decoupage, quilts, bags, knitted things and handmade books.